There was a good discussion on twitter on memory overcommit and the value of memory overcommit and whether you should or should not use it in production. What struck me in this was that on a subject like this, there is so much misunderstanding although there is a lot of documentation available that can explain the subtle difference between good and bad overcommit of memory. 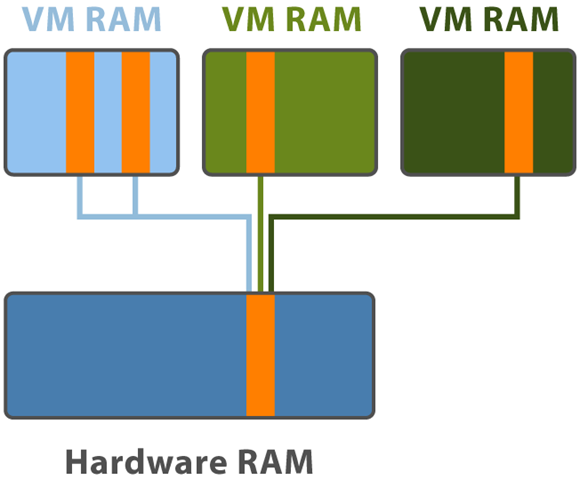 In short: When you assign more RAM to your VMs than available in your host. Good memory overcommit: When you assign more RAM to your VMs than available in your host BUT never cross the line where the amount of RAM that is USED by your VMs is more than available in your host. Bad memory overcommit: When you assign more RAM to your VMs than available in your host AND cross the line where the amount of RAM that is USED by your VMs is more than available in your host. Host has 48GB of RAM and just for the sake of argument we’ll pretend the hypervisor doesn’t use any RAM and we don’t have memory overhead per VM. I now start loading it with VMs that have 4GB RAM assigned. Without any memory overcommit I can load this host with 12 VMs of each 4GB. Now let’s say, these VMs normally use only 2.5GB of RAM but sometimes they peak to 4GB. With memory overcommit I could now load the host with 19 VMs of 4GB RAM assigning a total of 76GB RAM and demanding 19 x 2.5GB = 47.5GB of physical memory. Even to me this is a bit on the edge, so I’d reserve some RAM for spikes and would go back to 17 VMs, which would leave me with 17 x 2.5GB = 42.5GB of actively used physical RAM, 17 x 4GB = 68GB of RAM assigned and therefore 68GB-48GB = 20GB of overcommitted RAM. So, 20GB of RAM I didn’t have to pay for. This is a good use of memory overcommit. Bad use of memory overcommit is when in the previous example I would place more VMs on this host, to the point where the use of physical RAM is higher than the amount of physical RAM present in the host. ESX will start some memory optimization and reclaim techniques, but in the end it will swap host memory to disk, which is bad. It is essential to carefully monitor your hosts to see if you’re moving from good memory overcommit to bad memory overcommit. The mechanism below memory overcommit is called Transparent Page Sharing (TPS). Using this technique ESX scans if pages in memory for one VM are identical to pages of another VM by using hash values and if they are ESX doesn’t store that second page in physical memory but just places a link to the first page. When the VM wants to write to that page, then the link is removed and a real page in physical memory is created. This technique called Copy-on-Write (CoW) will incur an overhead compared to writing to non-shared pages. The scanning of the guests performed by the hypervisor is done at base scan rate specified by the “Mem.ShareScanTime” which specifies the desired time to scan the VMs entire guest memory. By default ESX will scan every 60 minutes, but depending on the amount of current shared pages, ESX can intelligently adjust this scan frequency. When performance is measured between a system with no page sharing, default page sharing or excessive page sharing (forced by the test), it shows that default page sharing performs 0,2% slower and sometimes 0,2% faster than without page sharing. Page sharing sometimes improves performance because the VM’s host memory footprint is reduced so that it fits the processor cache better. To be short, no it is not. But you probably expect more from me than just this. Let’s be clear about doing bad overcommit which is always a performance hit. As soon as your ESX hosts is out of physical RAM and starts swapping to disk, there is a big performance hit which should be avoided at all costs. 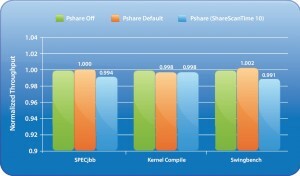 Scott Drummonds (VMware) recently wrote about using Solid State Disks in your SAN to be used as swap space for your ESX host (http://vpivot.com/2009/12/24/solid-state-disks-and-host-swapping/), which would make less of an issue but still there is a performance hit. 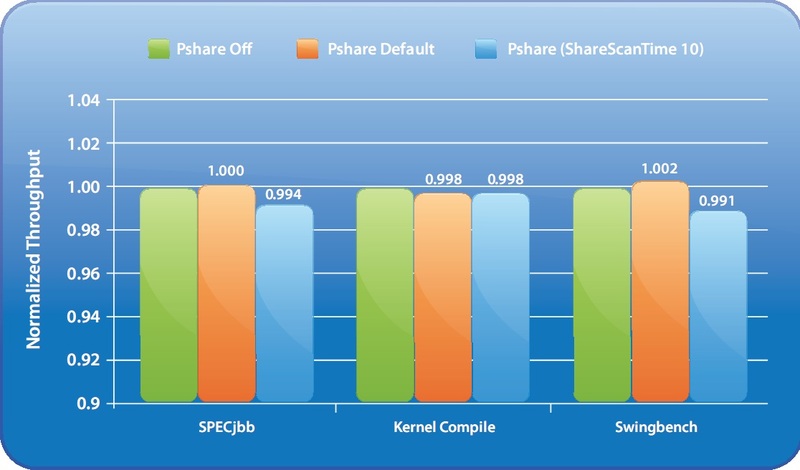 But with good overcommit the performance hit is very low as you read in the previous section. There is also a fase in between good and bad overcommit and that is when your good overcommitted host is getting low on free physical memory. 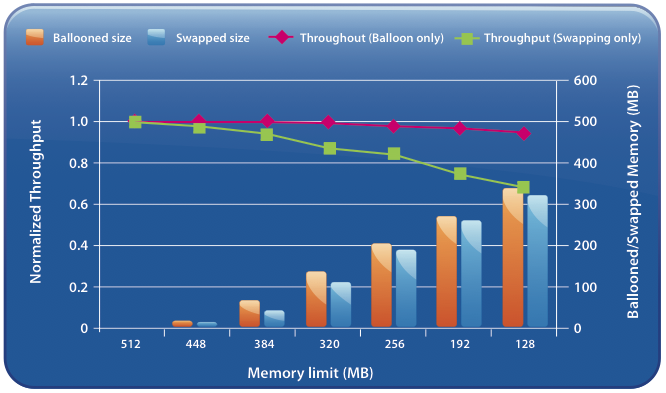 When this situation occurs, ESX will start looking for unused but claimed memory by the VMs and will try to reclaim memory by using a technique called ballooning. The balloon driver inside the Guest OS is triggered by ESX to try and claim free pages by demanding memory (inflating) from the Guest OS. The Guest OS will then use page reclaiming algorithms to determine which pages can be assigned to the balloon driver. First the OS will assign pages marked as free and if this is not enough the OS will move less important pages to the OS swap file to free up pages and assign these to the balloon driver. Next the balloon driver tells ESX which pages it has received and since the balloon driver will not actually use them, ESX can safely re-use these pages for other VMs. As with TPS, there is a performance penalty for this ballooning, but again the penalty is very low. In the graph below you can see that even with reclaiming 3/4 of the VMs memory, the performance penalty is only 3%. Looking at the performance impact of swapping host memory, we see that the throughput loss is about 34% which is a huge difference compared to the 3% for ballooning. FIRST CONCLUSION: No performance hits !!! The conclusion to draw from this, is that the performance impact of Transparent Page Sharing and ballooning neglectable and memory overcommit is NOT a performance hit !!! Let’s move on to the remaining misconceptions on memory overcommit. Real world workloads don’t benefit. A common misconception is that TPS and ballooning will not work for the majority of applications. I have done a lot of searching for problems with applications in a virtual environment that could lead back to TPS or ballooning but could only find two situations in which there is a “problem” with TPS or ballooning. One situation is when running a Java application. – Java is the only known application that can have a performance hit when ballooning kicks in. – When using V-MMU compatible CPU’s in combination with large pages a performance degradation can be expected when ballooning kicks in. How much memory would you expect to gain from using TPS? Keep in mind that TPS works at page level, not only between VMs with the same Guest OS, but across all Guest OSes. Not just over VMs but also within the same VM. You could theoretically already save memory through TPS with just one VM running on your host. – As the table shows, memory savings thanks to TPS can be really huge and the price of memory saved by TPS is easily worth the extra buck for ESX licenses. In the paragraphs above I think I made clear that there is no reason to NOT use TPS unless for specific applications. The only reason left for some people to not use TPS is that if you just keep on filling your host with VMs, it will soon start swapping (which is the bad form of overcommit) and they’re absolutely right. But may I ask this question: “Don’t you monitor what you are doing?”. When I have a one liter bottle and I want to fill it with water, while filling it I usually keep an eye on (monitor) how much water I already pored into it and stop just before it’s full. I think this same practice can be used in many places, even in IT infrastructures. Number of users on your Citrix hosts, I bet you monitor performance and start adding more hosts when certain limits will be reached. Or adding data to your disks, I bet you daily check to see if your disks aren’t near their limit. Creating snapshots of VMs in your virtual infrastructure, check your datastore if these snapshots aren’t filling up your space and please, do tell me you keep a sharp eye on those thin provisioned disk. Now, if you do all that and consider those techniques as save, I can’t see why overcommitment would be dangerous. Just monitor !!! – There is no danger, no hidden risks, just as long as you monitor what you are doing. I would to thank my twitter friends how promptly responded with esxtop screenshots when I called out for help on twitter. Thanks guys. And a big thank you to Duncan and Scott for providing great posts which helped me put together this post. Thanks. ESX, memory, performance, VMware bad memory, balloon driver, ballooning, commit, driver, ESX, hyper-v, hypervisor, memory, misunderstanding, over, over-commit, overcommit, page, physical memory, physical ram, sharing, spikes, tps, transparent, transparent page sharing, vm, vms, VMware, vmware tools. permalink.